Entering through our main entrance feels like walking into a Japanese cabin in the woods. 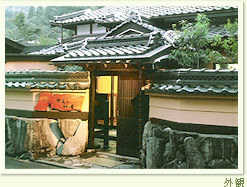 Inside is a private partial open-air bath and delicious Japanese cuisine made with local products. Our newest reservable private and partial open-air bath is 'Madoka no Yu'. It's slightly on the small side but is filled with charm. Relax in the stone bath as hot spring water flows from the trees, into the stone basins and then into the bath. 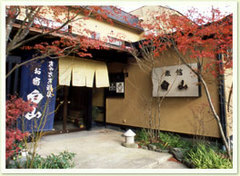 The most popular partial open-air bath is 'Seseragi no Yu'. A small babbling mountain brook and lush undeveloped woodlands provide a natural and gorgeous backdrop. It isn't hard to see why our gardner calls this his best work. The bath is in an annex building, a short distance from the main building and has two separated baths (for men and women). Our long awaited and anticipated guest rooms with attached private open-air baths, total of 5, are now available and awaiting their next guest. One room is equipped with a bath made specially from a rare umbrella pine wood. There is a small picture book library in the lobby, with selections popular with children and ladies. Don't pass up the chance to to experience the loveliness of a traditional Japanese hot spring town by wondering to the several open-air public hot spring bath houses. 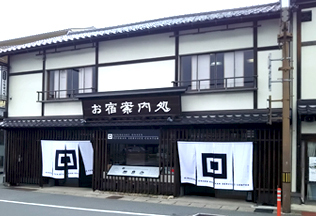 The popular 'Sato no Yu' is only a seven minute walk from here. For a more authentic feel we suggest wearing a traditional Japanese yukata(cotton kimono), provided by the inn, and don't forget your bag of bathing amenities. All rooms in the main building have a restroom (8 of the restrooms come with a bidet), TV, and individual AC unit, down comforter. 17 rooms have a refrigerator.